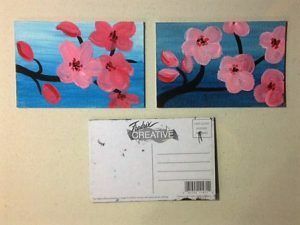 Is a Mobile Art Provider that brings the fun and creativity to your home or business. 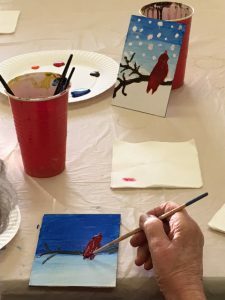 Whether you are planning a birthday party, looking to entertain a group of any age at a gathering, or seeking an activity that benefits your retired residents, we create an art endeavor that suits your needs. No experience is necessary and no special preparations on your part.. We provide all materials necessary, we set up and clean up, you just provide table space and a chair for every participant. Artwork can be created to suit your theme, or you can choose one from our seasonal selections. Acrylic paints, Watercolor paints and Oil Pastels are the most often chosen mediums for ease of use, cleanup and safety. Larger Canvas are available upon request.